Stacy Tilton Reviews: Welcome to Fishers, Indiana - Population FUN! Welcome to Fishers, Indiana - Population FUN! Do you remember visiting a place as a child and later as an adult think some day you'd like to take your kids there? For me that place was Conner Prairie. I can remember going there with my 5th grade class for a field trip. I can recall how much fun I had and all of the neat stuff we got to see while we were there. And after seeing them at a media event recently and finding out about all of the new exhibits they've added since then I just knew I had to go back. So that's exactly what I did - and this time with my family! We had a week of vacation planned just for exploring places near home right here in Indiana and today was all about the town of Fishers. Since it was Father's Day I wanted to plan a day of things my husband would enjoy, and being a history buff this was right up his alley. Boy was it different than it was all those years ago when I first went (of course I won't go into detail just how many years ago it was). You could tell that over the years they put alot of thought, time, and money into making it even bigger and better. From the moment you enter the front doors you're taken back to the 1800's as you visit their indoor Create.Connect exhibit. I really liked this addition because it gave you a place indoors to visit just in case it was super hot out, or raining. Plus it was filled with several hands on experiments you could explore with your family. We made paper airplanes that we got to test fly, built a windmill, and got to explore circuits of electricity. It was nice seeing the kids work together peacefully! After we were done exploring inside we went out the back doors and checked out all of the historic themed areas outside. Let me tell you it was nothing like is was back when I went as a kid. There was so much more to explore and see. Yes I can remember some of the buildings and things I heard the people say as we visited them, but there are alot more places than there was back then. 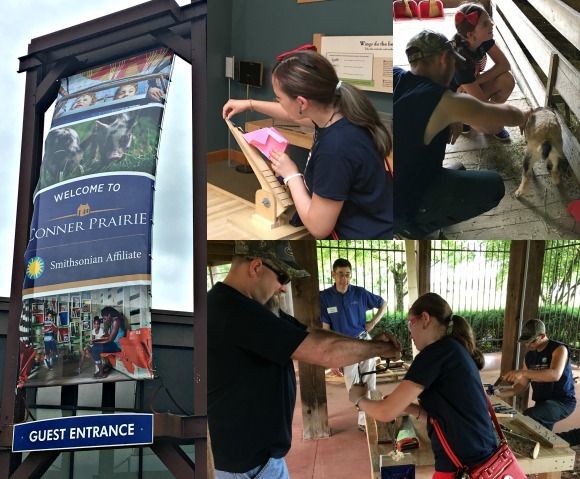 I think the kids most enjoyed the Animal Encounters barn (because we have animals at home) and the pop-up woodworking exhibit. It was awesome seeing them and their dad all working on a project together. They ended up making a mallet with a big head like you would see in a cartoon. It even sparked my son's interest so much he started researching the wood shaving tool they used. So I guess you could say the first part of our day was a big success. Everyone found something that really interested them and we all had a nice time together...with no arguing or fighting. After our adventures at Conner Prairie it was time to stop off and have some lunch. We were all good and hungry after all of the walking we did. I'm a big fan of restaurants that cook foods from scratch because it reminds me more of a home cooked meal so we opted to stop off at a local restaurant called the Pure Eatery. I would much rather sit down and enjoy some family time waiting for a good cooked meal than rushing through a fast food joint and regretting it later. 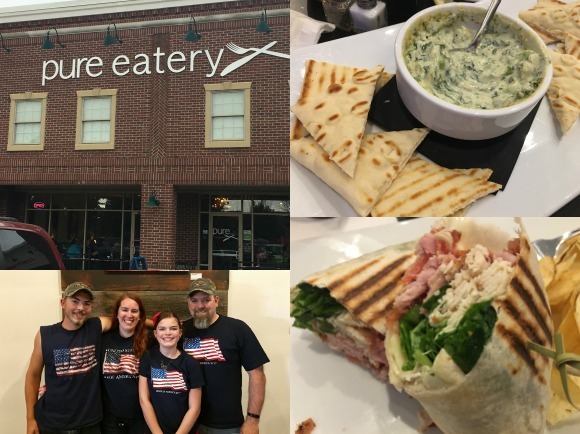 Pure Eatery makes their foods fresh every morning, and they make their soups and dressings all from scratch. Now that's my kind of restaurant! To start with we had a Spinach & Asparagus Dip appetizer plate and let me tell you it was so good even the kids couldn't get enough of it. It was a first for me having the spinach dip with asparagus instead of artichokes and I really liked it. I think I could have eaten the entire thing by myself as a meal and been happy. Of course that would have mean I missed out on trying their Club Wrap. It was really good too so I'm glad I didn't. My husband had their Pig Out sandwich, my son had a Chef Salad, and my daughter had a Mini Quesadilla. Everyone left satisfied...and stuffed. But not before I asked our waitress to snap a photo of us. It's hard to get everyone in one photo when you're on vacation so I took the opportunity when the area we were seated in cleared out. It definitely made lunch memorable. After lunch we headed down the road to K1 Speed a local indoor go-kart racing track. It was a little busy when we arrived so we played some games in their waiting area before the kids were up for their ride. It was nice to just hang out and relax as a family and just unwind a little. The kids took their first ride while my husband and I watched from the sidelines. My son really enjoyed it, but my daughter was too nervous around the people that kept whizzing past her. So my husband ended up using her second race pass. I was totally okay with it since it was Father's Day and all. It was fun seeing the boys out there together trying to out-do each other on the track. 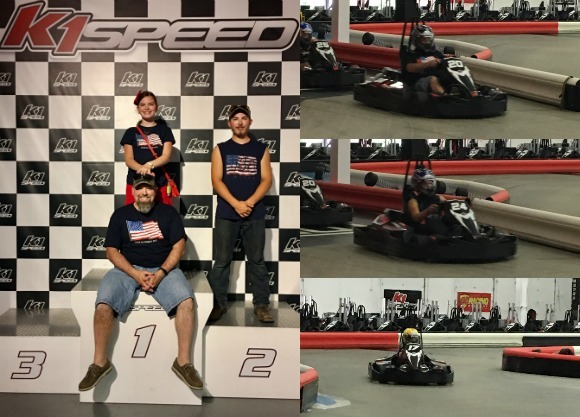 At the end of our visit my daughter decided that her dad and her both got first place and her brother got second. Normally my son would argue up one side and down the other with her, but not today. He knew it was dad's special day and didn't want to ruin it. I was pretty proud of him for not saying anything and just silently standing there on the number two block. And to finish off our special Father's Day adventures in Fishers we ended our day at The Escape Room. My husband is one of those guys that likes to solve puzzles and he likes to be challenged at the same time. So with that in mind I knew he would like what The Escape Room had to offer...plus I had been dying to go there myself so that didn't hurt either. I had some friends that went and told me how much fun it was so I was really excited about going. Our room theme was "The Race 2". 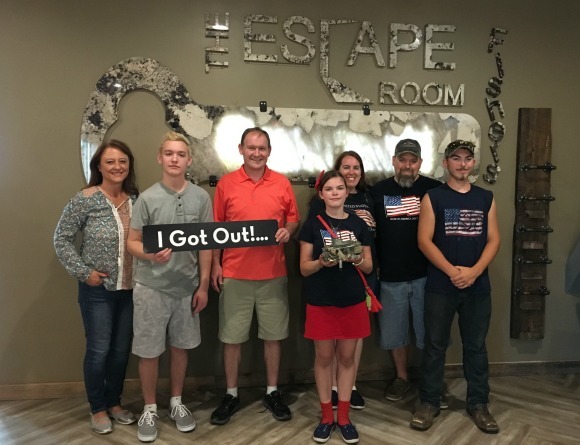 We were up against another team trying to be the first ones to solve all the clues and find the security code to unlock the box that contained the replacement four-barrel carburetor we needed to repair our car for the race. Right off I will say it's quite an adventure. You have one hour with your team to find clues that lead you to other clues that will eventually lead you to figure out the code you need. If you're in a room with people you don't know I will say that can add to the challenge a bit. We had three other people we didn't know in our room and they kept trying to do everything their own way since they had been in one before while we were trying to just figure out what the heck we were even doing at all. But even though we had some frustration of them not following all of the directions when they did find them we did make it out before time ran out! And I have to say we all really enjoyed the experience. We've actually already been looking into doing another one soon with some friends so we know who we are in the room with. At the end of the day we all really enjoyed our first family visit to the town of Fishers. I know there are several other great places to explore there that we didn't have time for so I'm hoping we can get there again before summer is over for another day trip. I challenge you if you're not familiar with towns near your hometown to check them out, you'll probably be just as surprised as I was at how much fun is just waiting for you within an hour of home. what a fun family adventure. I have seen so many great things about those escape rooms. Looks fun. WE are going on a few staycations like this and I cannto wait. WE need a little family time. We don't usually go back to places we visited when we were children. Spending a vacation with family and exploring the historic themes area is a nice way to have interesting things together. Playing a strategy game in the escape room sounded so fun. I wish I could also play with our dad. This sounds like such a great Father's Day! I've only done one Escape Room but it was so much fun. The group of friends I was with and I all made it out in time and almost beat the winners for shortest time. I hope you and your family had a great time! How Fun!! I am so not ready. We are still trying to decide whether we want to go to the hassle of cooking out or simply spend the day having fun and visiting family. Looks like you made a great choice for your day! This sounds like such a great Father's Day! Playing a strategy game in the escape room sounded so fun. Looks like you made a great choice for your day! I love taking family adventures together! Sometimes you don't need to go far or go anywhere fancy to find things that everyone can enjoy and it turns out to be the best trip ever. Glad you had fun! My kids may still be too young for the escape room right now, but I know they'd love to see all those lovely animals. Those go-karts look fun too. What a great family adventure! I would love to visit Fishers one day! What are your highlights of this stunning place? Looks like fun! I would love to do an Escape Room with my family. Sounds and looks like a good time.